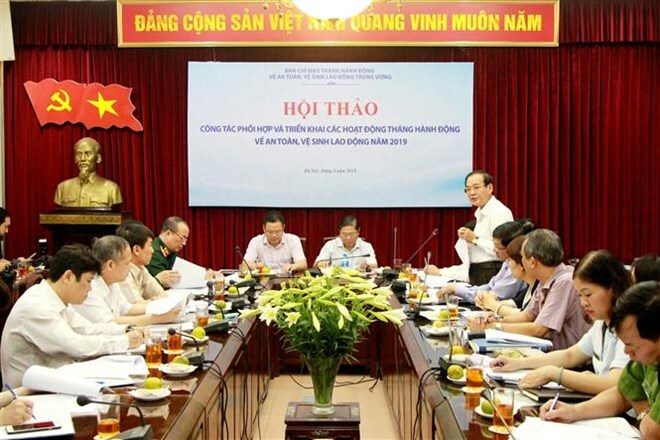 Hanoi (VNA) – An action month for labour safety and hygiene this year will be held in May, with the launching ceremony to be organized in Quang Nam province on May 4. At a press conference held on April 11, Ha Tat Thang, head of the labour safety department of the Ministry of Labour, Invalids, and Social Affairs said 7,997 occupational accidents occurred nationwide in 2018, taking the lives of 1,039 labourers and leaving 1,939 others seriously injured. Localities with most occupational accident fatalities in the year included Ho Chi Minh City, Hanoi, Hai Duong, Thai Nguyen, Yen Bai, Dong Nai, Quang Ninh, Ca Mau, Quang Nam and Binh Duong provinces. Most of occupational accidents occurred in construction, building materials production, metallurgical engineering, and other fields. Employers held accountable for nearly 46.5 percent of the total occupational accidents, in which their failure to build safe working practices for employees accounted for 24.56 percent and their failure to fully train safe working practices for employees accounted for 7.2 percent. Meanwhile, employees’ violation of labour safety practices was blamed for 18.42 percent of the total accidents.